Marcus King is an American singer, songwriter, guitarist and band-leader whose "musical ability is evident throughout The Marcus King Band, the young phenom's 2nd full-length LP and first for Fantasy Records. Operating within the fiery brand of American roots music that King calls "soul-influenced psychedelic southern rock," the album highlights King's gorgeous, rough-hewn vocals, soaring guitar work and heartfelt songwriting all amidst a group of masterful musicians who, together, are quickly becoming one of the country's most sought after live acts." "Raised in Greenville, South Carolina, King was brought up on the blues, playing shows as a pre-teen sideman with his father? "bluesman Marvin King, who himself was the son of a regionally-known guitarist? "before striking out on his own. 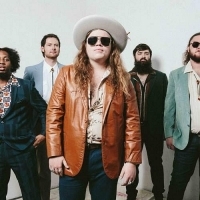 Going beyond the sonic textures of his acclaimed 2015 debut album, Soul Insight; The Marcus King Band broadens his sound, touching upon everything from funky R&B to Southern soul and Americana in the process. His band gets in on the action too, stacking the songs with blasts of swampy brass, a lock-step rhythm section and swirling organ. Ever the multi-tasker, King bounces between several instruments, handling electric and acoustic guitar ?" as well as pedal and lap steel ?" while driving each track home with his soulful, incendiary voice."